According to our author-scholar Kajetan Fiedorowicz, the best Maori comb ever offered on Ebay sold on Oct. 9, 2011, for $2,576.00. It was a 17th-Century whale-bone Heru comb. The dealer listed it as “Old African? Large “oxbone” comb; elegant!” with a starting price of $9.95. In 1200, Rua-tupu, the second son of Chief Uenuku, wore a Heru without permission. These combs could only be worn by the elder sons. His father belittled him. To get revenge, Rua-tupu took children of tribal noblemen into his canoe, traveled far into the ocean, and sank the boat. It is an incident in Maori history called “Te huri-pure-i-ata.” His older brother, Kahutia-te-rangi survived with the help of a whale, and his name changed to Paikea, or whale rider. The myth says Paikea had the help of the goddess Moa-kura-manu. 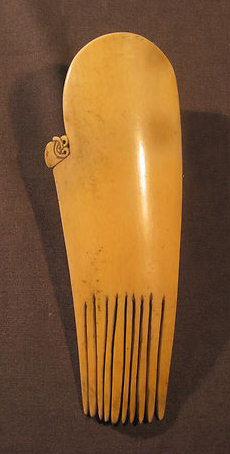 What I think this comb depicts is Kahutia-te-rangi (the small carving on the left) riding the whale. Think of the age, look at the condition, marvel at the orange patina on the whale bone. Absorb the simplicity of design, which expresses the profound mythology of Maori culture. The comb is a revelation. Kajetan hoped it went to a museum where it belongs. We will never know. However, we have the picture. Our community will recognize this comb’s significance, history, and have yet another example that design reaches its greatest heights in simple forms.